Tracy Grave, an Italian composer, singer, and songwriter had gotten his start with music, as his career choice back in 2000. Since then, he has gone on to be involved in numerous projects. His most recent being cleverly named after himself, as Tracy Grave. The band was then born, releasing a new full-length album titled "Sleazy Future"(2018) via Volcano Records. This release consisting of the set of genres, Tracy knew best, hard rock, sleaze, AOR, and glam! That is precisely what you get upon hearing the album, discussed about right here, right now. At first listen, you are stricken with "Cemetery Sin", the opener, of the album, it being quick yet edgy. It immediately takes you back to an era of the 80's time frame, think of the bands used for the rock musical "Rock Of Ages", that is what this track is all about. Same has to go for a lot of the other material as well. Like take such tracks as "Dirty Rain", an immediate classic, being a lot like "Every Rose Has It Thorn". Whereas "Without Scars", "Dancing On The Sunset", "Make You Feel The Pain", and "Over The Top", bring you right back to that "Rock Of Ages", musical feeling. Think of the acts that were in that musical or even the film, like Journey, Scorpions, Poison, Whitesnake, and Def Leppard, their music, is what Tracy Grave is so much like. 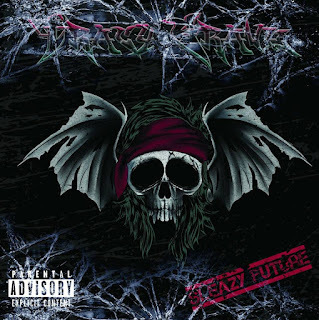 If you enjoy classic rock with some dash of sleazy hard rock, then most certainly "Sleazy Future", is the solid album, to keep your rock veins pulsating for hours on end!